I just got this great pineapple cutter form Magikuchen. It’s made of stainless steels so it’s very durable and well made. Has a plastic handle for turning the device. It’s very easy to use. Just insert the cutter into a pineapple and turn using the handle. It will cut down into the pineapple and cut out spirals of the pineapple. You can remove the handle for easy washing as well as to remove the spiral in one piece. We love pineapples in our home when they are in season. This makes really quick and easy cutting. Plus I love the spiral that it comes out in, I can do a lot when it comes to presentation with the way it is cut. Super cool. It’s a great tool to have on hand. ✔YOUR 5 A DAY: Perfect MUST-HAVE tool for all fruit lovers. This Ratcheting Pineapple Slicer effortlessly peels, cores and slices an entire fresh pineapple into perfectly shaped pulpy rings while retaining all the juice with minimal waste. 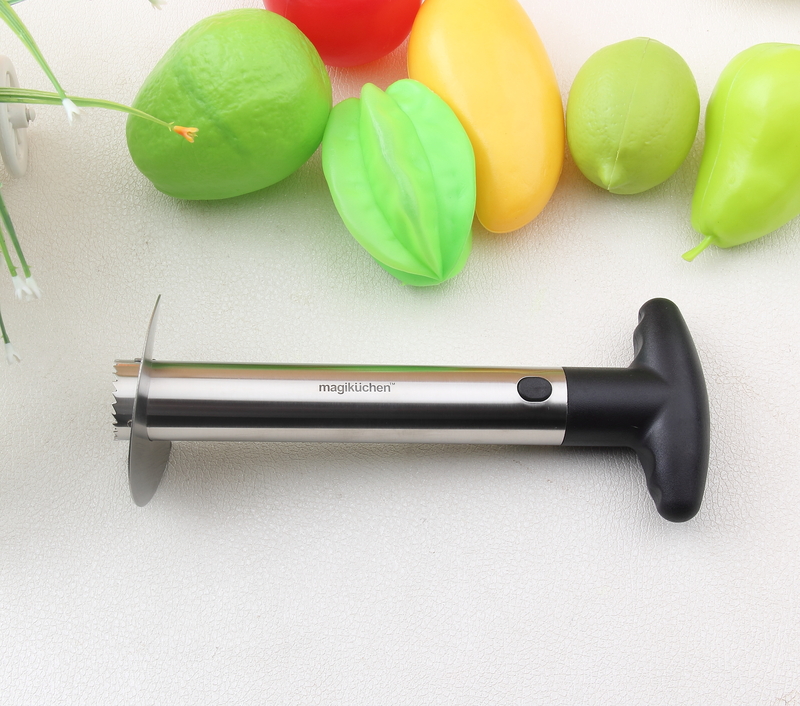 ✔ FOOD SAFE: Pineapple peeler is a Premium High Quality kitchen tool built to last! BPA free, FDA approved made from pure 100% Food Grade stainless steel. Healthy and safe essential for every fruit lover and health fanatics. ✔ EASY TO USE: It has soft touch strong non-slip grip handle for ergonomic quick and easy coring and slicing of fresh pineapples. Use it for pineapple cake, pineapple upside down cake, pineapple chunks, salsa, jam, jelly or other recipes. ✔ BEST IN QUALITY & 100% DISHWASHER SAFE: Made of durable, stylish, rust-proof, razor sharp, stainless steel blades so it won’t tarnish or get dull. Can make one slice at a time or cut the entire pineapple at once. Designed to make it incredibly easy to clean using the dishwasher and breezy when hand washing too.